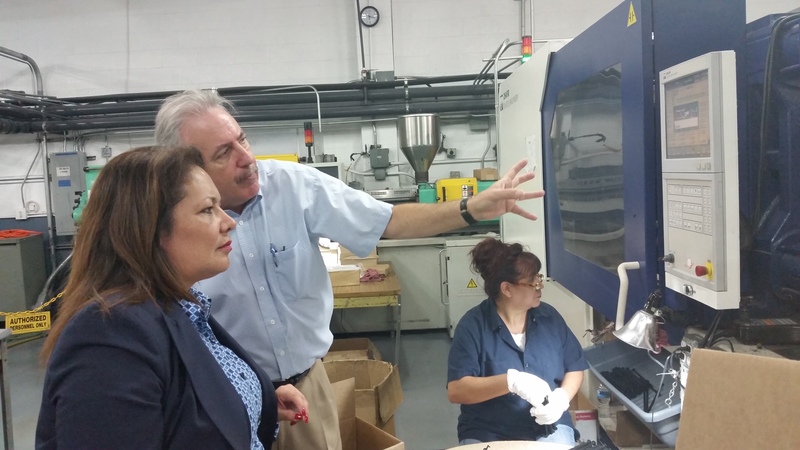 California State Assemblymember Patty Lopez (D-039) toured C&G Mercury Plastics in Sylmar, California on July 20, 2015. Family-owned and operated since 1947, C&G Mercury Plastics is a custom injection molder and has found a niche helping turn concepts into plastic injection molded realities. C&G Mercury Plastics serves a variety of manufacturers, including aerospace, electronics, construction, housewares, toys and sporting goods companies. Assemblymember Lopez and President Greg Leighton discussed the company’s history as a plastics manufacturer in the Los Angeles area as well as several general policy issues. They joined General Manager Jesus Hernandez for a tour of the facility. The Assemblywoman found the machinery and the process very interesting and enjoyed meeting the workers. Lopez and Field Representative Ricardo Benitez urged Leighton and SPI to contact her when her assistance is needed in the future. She is anxious to work closely and build relationships with local businesses including C&G Mercury Plastics. C&G Mercury Plastics President Greg Leighton (center) shows CA Assemblymember Lopez some of their operations and their equipment. Ricardo Benitez (center) from Assemblymember Patty Lopez’s office presented Greg Leighton (left) and Jesus Hernandez (right) with a certificate of recognition. Founded in 1937, SPI: The Plastics Industry Trade Association promotes growth in the $373 billion U.S. plastics industry. Representing nearly 900,000 American workers in the third largest U.S. manufacturing industry, SPI delivers legislative and regulatory advocacy, market research, industry promotion and the fostering of business relationships and zero waste strategies. SPI also owns and produces the international NPE trade show. All profits from NPE are reinvested into SPI’s industry services. Find SPI online athttp://www.plasticsindustry.org and http://www.inthehopper.org.